Vita e morte. Per i miracoli mi sto attrezzando. 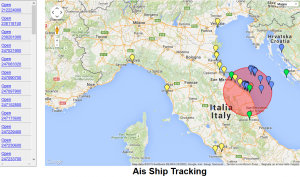 AIS system (stands for Automatic Identification System ) was developed to increase safety at sea. Ships broadcast their position automatically on a periodical time base and all vessels equipped with an AIS receiver or transponder, are able to plot other ship position, course and other information. Data are transmitted on VHF Maritime band using GMSK modulation scheme, and are easy to receive using a special pourpose equipment or a common marine RTX with an external data demodulator (a PC and a soundcard will work great). 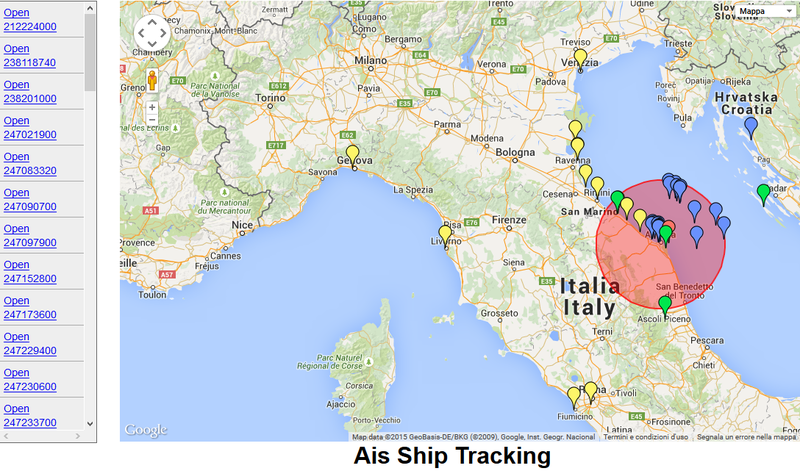 AIS Receiver has been provided from Marine Traffic in order to extend coverage of the network on Ancona area. Atenna system is installed on the top of the “tower” of Faculty of Engineering , at 205 meters above sea level. The location is very good for wireless installation as there are no obstacles for many kilometers all around the tower. AIS protocol decoder has been developed using php language, in order to make it really “platform independent”. PHP language provides a lot of functions for string manupulation, which are very usefull in the decoding process. Many different message types are decoded using our engine, out effort is to add even more decodinf function to the software. Information retrived from protocol’s payload are displayed on screen and stored in a mysql database for further “off-line” analysis. Further processing of data stored is done using a bash/php script which is run every minute. Data processed from the script are fed to MRTG system which takes care of displaying results. 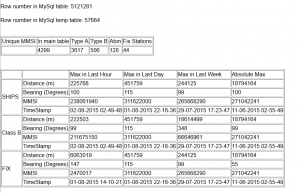 Decoded data can be accessed via AIS web site. Registration is mandatory for statistical pourposes only. Email addresses will not be published. Ocasionally we may send you a newsletter, to inform about site or code improvements. Code will be occasionally updated in order to fix major bugs or reflect some changes in the protocol. Changelog follows. 22/04/2016: fixed php dispatcher. Avoid replicating outgoing packets. Please don’t waste your time re-inventing the wheel. Access our code (Released as GPL v3) and use it for your needs. Feel free to help us developing new code, adding more functionalities and making it even faster. Due to google code shutdown, the project is now hosted at this site. Code is released under the GNU GPLv3 license and can be obtained for free, please download it from this link, on GITHUB. Please feel free to contribute to the project, improving code. Contact us for further information!